The human toll of the latest Gaza war was appalling: more than 2,200 were killed and more than 11,000 were wounded, including almost 7,000 women and children. Hundreds of Palestinians with devastating injuries from last year’s 51-day war in Gaza still fill Médecins Sans Frontières/Doctors Without Borders (MSF) waiting rooms. Today MSF sees, perhaps more than at any time in its 20-year history in Gaza and the West Bank, how the suffering wrought by the Israeli occupation has become normal. It appears an end to the occupation is the only way to ease the suffering of Palestinians. 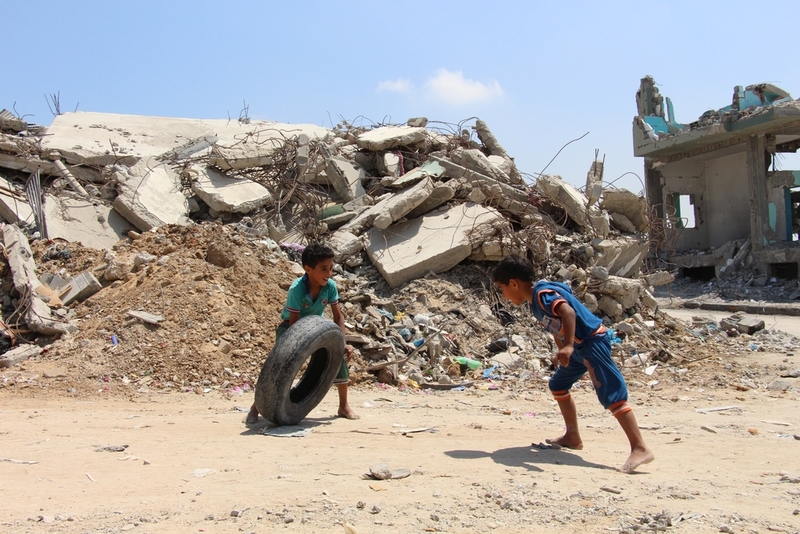 “Eight-year-old children in Gaza have known nothing but the blockade and war since they were born,” says Erwan Grillon, MSF’s head of mission for Gaza and the West Bank. In MSF clinics, Palestinians still dealing with the complications of their war injuries are now packed alongside Gazans, mostly young children, who have suffered from home heating and cooking accidents as result of being forced to live in makeshift or damaged homes. The MSF team change a dressing in our Khan Younis tent clinic, in the Nasser hospital compound. More than 12,000 houses were damaged or destroyed during the war, as were more than 70 hospitals or health structures. The Israeli military blockade of Gaza continues to starve the territory of desperately needed supplies, including building materials that could help rebuild some of the neighbourhoods that were reduced to rubble by the Israeli military. Israel has put severe restrictions on cement and other building materials, which are considered “dual-use” items that could be used to create weapons, leading to few houses being repaired in the strip. “Living conditions keep on deteriorating,” says Grillon. Ahmad, a young man in his 20s from Shaja’iya, in the north of Gaza Strip. 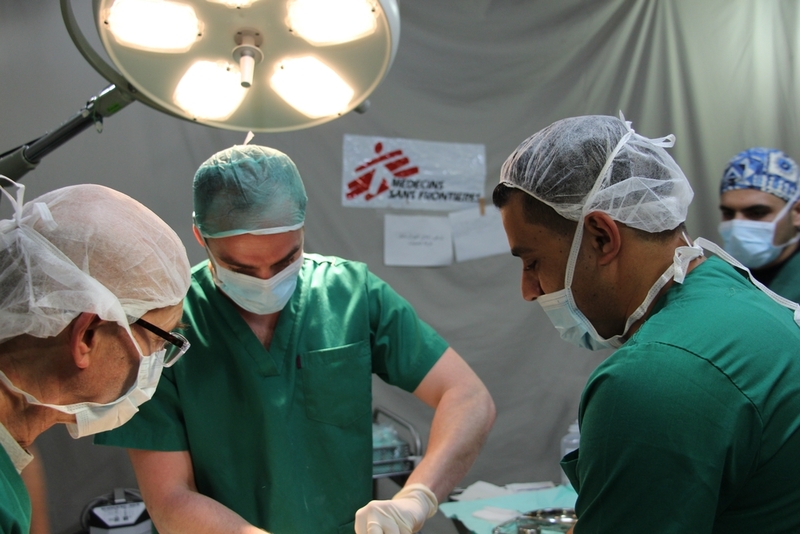 Ahmad is in MSF’s Gaza City clinic. “I was on my way from my home to the mosque when suddenly I heard an explosion in nearby Shaja’iya, so I ran to see if I could help. I saw a little girl, maybe six-years old, who was dying, so I picked her up. While I was carrying her to the ambulance, there was another explosion and all the people around the ambulance, including me, were injured and some were killed. I was hit by shrapnel, and my left leg and my neck were injured. Now I need surgery and I’m hoping that I’ll be able to go abroad for it through MSF. Rasha, a 22-year old woman from Khan Younis. Rasha is in MSF’s tent clinic in Nasser Hospital attending consultations for her first round of surgery on 1 April 2015. "I was injured on 29 July. I was burned all over. It happened in my home. They didn’t warn us, there was no alert. They suddenly shot at us. My father-in-law, mother-in-law and my sister-in-law were injured. And now my question is, ‘why us?’ Why did this happen? As a consequence of the blockade, people are still living in terribly unsafe conditions and are almost entirely dependent on outside aid. Unemployment is at record high—more than 40 percent overall and more than 60 percent among the young—and 80 percent of the population is at least partially dependent on humanitarian aid. While the devastation of the war in Gaza and the ongoing blockade of the strip have garnered the most international attention, the occupation of the West Bank illustrates another form of oppression that also has widespread public health consequences. The Palestinian population in the West Bank is subjected to indignities, threats, and humiliations on a daily basis. Today, due to settlements, byways, checkpoints, and military deployments, Palestinians can only inhabit less than 40 percent of the West Bank. MSF mental health programmes are filled with patients suffering from psychological disorders as a result of being subjected to endless harassment, frequent (and unpunished) settler violence against individuals and property, night raids, administrative detention, or other acts. “The stories our teams tell us are such that merely stating the facts should be enough to denounce them,” says Grillon. As a direct result of the perpetuation of the occupation and the complete failure of any political process, Palestinians in both Gaza and the West Bank are trapped in a never-ending cycle of violence that must be addressed frankly and urgently. Shuja’iya, northeastern Gaza Strip, one of the hardest hit areas during the 2014 summer war. Measures taken by Israel in the name of security must be judged in terms of their humanitarian fallout. And the governments and international institutions either explicitly or tacitly supporting these policies must likewise consider the human costs of these policies, given the undeniable devastation they have wrought. “Trying to create a false equivalence in terms of responsibility for the current situation in the West Bank and Gaza simply obscures the reality of responsibility for the violence in the Occupied Territories,” says Dr Mego Terzian, president of MSF France.